OPENING of The NEW LOGISTIC CENTER of Ferroli Group! 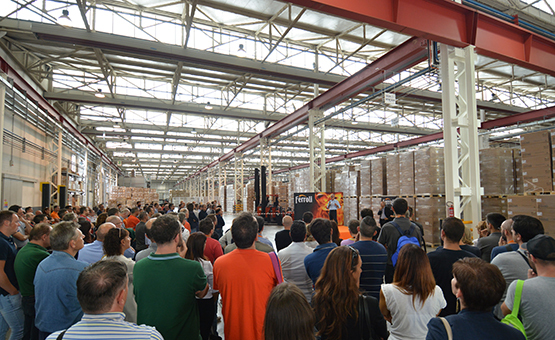 Great emotion and proudness for the opening of the new Logistic Center of FERROLI in San Bonifacio (VR). The Headquarter premises have been enlarged with a new area to allow the implementation of a new Logistic Hub with 10.000 square meters of covered surface, which will distribute products for all the brands, subsidiaries and direct markets where the Group is active (more than 100 Countries). The Logistic Center is equipped with new I.T. Systems and hosts various products offered in the wide catalogue of the Group ready for shipment: residential boilers, water heaters (gas & electric), air conditioners & heat pumps, stoves and pellet boilers, water treatment systems and solar thermal systems, including a number of original accessories offered as complement in the catalogue. The important investment in the new center will allow to have faster and more efficient delivery to customers, and is just a piece of a strategy of new projects, services and commercial initiatives which the company is enacting to enhance its presence on the market.